Touch screen Powered by N-Trig Technology, reduces off set and lag time between fine tip and trace, providing a feel that is closer to pen and paper and extremely responsive to hand gestures. 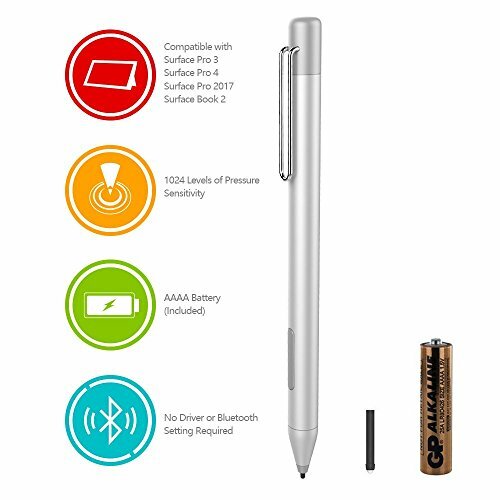 Does NOT need Bluetooth or drive, just to put an AAAA battery into the pen then it will work right away. It will cut off power automatically after 30 minutes if no use. High quality & Low-friction Tip Give you the accuracy you need an d provide superior control and traction against tablet screens. NOT for HP other device is not mentioned. Please contact us when you are not sure whether the pen is compatible with your devices or not. Compatible with Windows Ink: Improved N-trig technology allows you to write, draw and navigate with precision. 1024 Levels of Pressure Sensitivity: Much better than other brand pen, provide highly sensitive and precise writing & painting experience. Sketch, write, and erase naturally with no perceptible lag between the Pen tip and your line, just like you write by a real pen. No Driver required & Use Directly: Touch screen Powered by N-Trig Technology, no driver or Bluetooth setting required. You only need to put an AAAA battery (included) into the pen then it will work right away. [Package Included] 1 x Active Pen, 1 x Extra Tip Refill, 1 x AAAA Battery, 1 x Tip Remove Tool. 90 Days 100% Money Back Guarantee,12-Month Warranty & Lifetime Support Guarantee.